According to TMZ, Slash's estranged wife is trying to find the person that has allegedly been posting disaparaging comments about her online and accusing her of being a horrible mother. In her documents filed in divorce court, Perla Ferrar included hundreds of Instagram posts that reference private family information, as well as photos and details related to the activities and whereabouts of Slash's and Perla's two sons, 15-year-old London and 14-year-old Cash. Perla claims the posts also accuse her of being an "unfit mother and child abuser." Perla believes that the culprit is most likely someone connected to Slash — born Saul Hudson — and has asked the GUNS N' ROSES guitarist for any information he might have about the "altperlafhudson" Instagram account, which appears to have since been deleted. 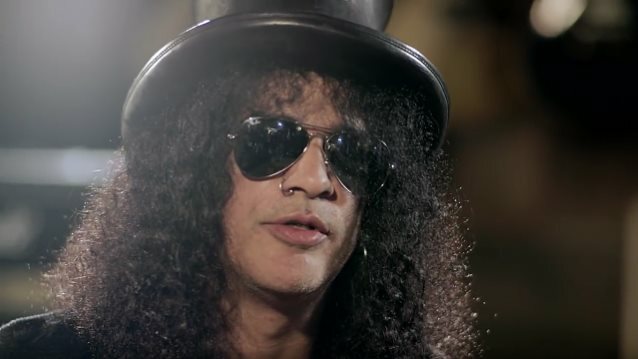 Perla is asking the court to force Slash's Internet service provider to disclose all IP addresses that have been used to control the Instagram account in question. Last month, Slash reportedly asked a judge to sign off on a settlement that would entitle Perla to over $6.6 million as part of their pending divorce. Slash filed for divorce from Ferrar for the second time in four years in December 2014. The couple reportedly did not sign a prenuptial agreement when they married in 2001, meaning that Ferrar would be entitled to half of Slash's income from 2001 to 2014. Back in 2016, Slash claimed that he and Perla were never properly married because Perla's one-month marriage to Carlos Marty in 1993 didn't actually end as divorce documents weren't properly filed. The mistake was uncovered when Slash and Perla applied for dual citizenship for their son Cash. Perla claimed the couple then hired a real lawyer in 2009 and a judge finalized her divorce from Carlos, making it retroactive to 1994. The "Not In This Lifetime" trek, which reunited Slash, Axl Rose and Duff McKagan, launched in 2016, and recently made its way through Europe.